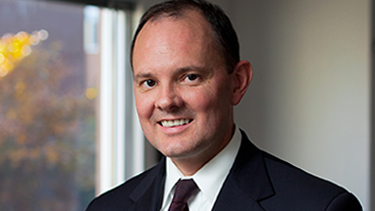 Dean Kevin Washburn will discuss crime in Indian country in a 4 p.m. Oct. 9 lecture at Albuquerque Academy in his role as the academy's Jack & Joanna Grevey Visiting Scholar for Democracy. The title of his lecture will be, "Addressing Serious Crime within Native Communities." Violent crime on Indian reservations has been a serious problem for decades. So far, efforts to address this problem have been weak and ineffective. Washburn will describe the problems, which he believes are structural, and explain some of the efforts under way to empower Indian tribal governments to address these serious public safety challenges. The following day, Washburn will lead informal discussions with academy students. The Grevey scholarship program was established with a generous gift from Eileen Grevey Hillson, Lisa Marie Clifford and Sean David Clifford. The program exemplifies the beliefs and spirit expressed in Albuquerque Academy's mission statement, in the tenets of the academy's annual school-wide diversity theme and in the Grevey family's longtime commitment to democratic values. The lecture will take place at the auditorium in the Simms Center for the Performing Arts on the academy campus. It is free and open to the public.